All September and October long, we have recruited you to help us on our mission to raise funds for breast cancer research. Every time you use promo code CGCURE, 10% of the proceeds get donated to The Stefanie Spielman Fund for Breast Cancer Research at Ohio State’s Comprehensive Cancer Center – James Cancer Hospital and Solove Research Institute. Using promo code CGCURE will also get you $3.94 off your order to cover the cost of U.S. economy shipping! We have seen some great designs coming through the production line that you have created to support the cause! However, with breast cancer awareness month coming to a close, we wanted to make one final push to raise as much money as possible! 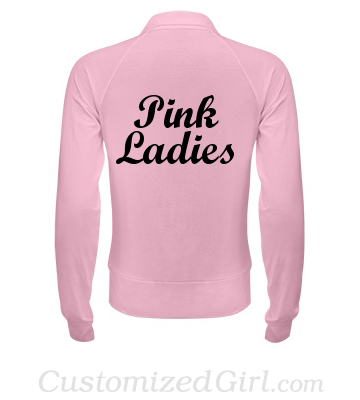 Whether you customize shirts for an event or for the upcoming holiday, use promo code CGCURE and help us make an even bigger donation to The Stefanie Spielman Fund for Breast Cancer Research! Once we have made our donation to The Stefanie Spielman Fund, we will share the donation amount with you on our blog! A big THANK YOU to everyone who has used the promo code CGCURE! Our breast cancer fundraiser is now complete! We raised $2,598.27 for The Stefanie Spielman Fund for Breast Cancer Research at Ohio State’s Comprehensive Cancer Center – James Cancer Hospital and Solove Research Institute. If it is your baby’s first Halloween and you want to take them out for their first trick or treating adventure, a custom Halloween onesie can make the perfect costume for your little monster! After all, you might as well get in as much trick or treat time with them as possible, because before you know it, they will no longer want to go! We have many cute, funny and scary Halloween onesies that will be sure to bring lots of attention and of course, candy! Oh yes, since your little one will be too young for the sweet treats, they will be all yours for the taking (another plus to celebrating baby’s first Halloween)! What if you still have a bun in the oven and want to join in on the Halloween fun? No problem! 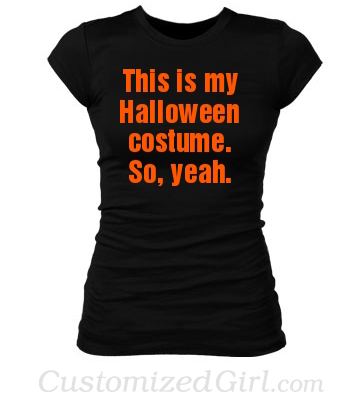 We have the best Halloween maternity shirts you can find! We have taken our popular peek-a-boo design and gave it a few scary twists! While the Halloween peek-a-boo maternity shirt is our most popular, we have many more Halloween designs that will make it a great Halloween for you and your baby! Congrats Melissa Rycroft! We Love Your Peek-a-boo Maternity Tank! 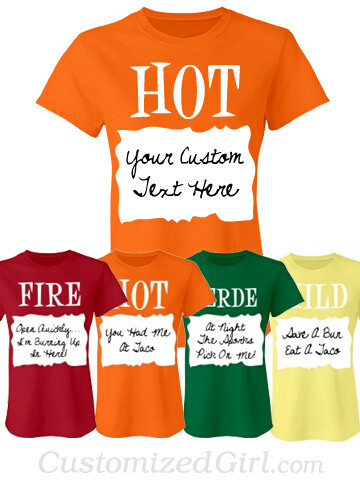 When searching the internet we sometimes come across celebrities who have chosen to create custom shirts on Customized Girl. 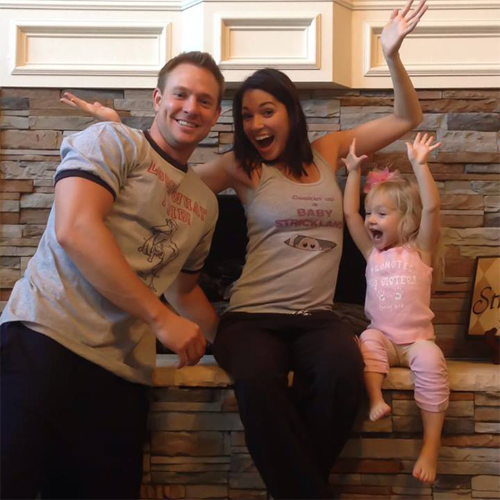 Today, we came across Melissa Rycroft’s custom peek-a-boo maternity shirt as she broke the news about her family expecting a new addition next spring! We instantly recognized the peek-a-boo artwork and fonts from our site. Melissa was not the only one sporting a custom tee from us as you can see from the picture below. She also customized a men’s ringer tee and a girl’s tank top. She did a great job using our design center to create totally unique t-shirts and tank tops. When it comes to Halloween, it’s hard to resist the urge to dress up as a favorite celebrity or character from a popular movie. We relish the opportunity to be seen as someone everyone will surely recognize, so what will be the hottest costumes this year? Based on popularity and the most shocking moments of 2013, we have compiled a list of five costumes that will certainly make an appearance this Halloween! Her performance and outfit at the VMA’s were definitely a surprise and shocked a lot of people! And thanks to that performance, we all now know what it means to twerk. The teddy bear leotard or the vinyl bra and booty shorts will bring any girl a lot of attention if she chooses this as her Halloween costume! She will probably be on this list until she is no longer performing. 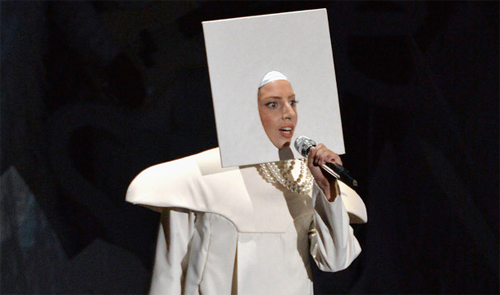 Lady Gaga is known for her crazy outfits and it is no surprise that she is in the top five! With every Lady Gaga appearance, we wait anxiously to see her new crazy look and for Halloween, we’ll wait to see what Lady Gaga-inspired costumes her little monsters create! A lot of eyes were on Amanda Bynes as she became a hot mess this year. There are bound to be plenty of Amanda Bynes costumes replicating her court appearance look of when she wore sunglasses paired nicely with a blue wig! 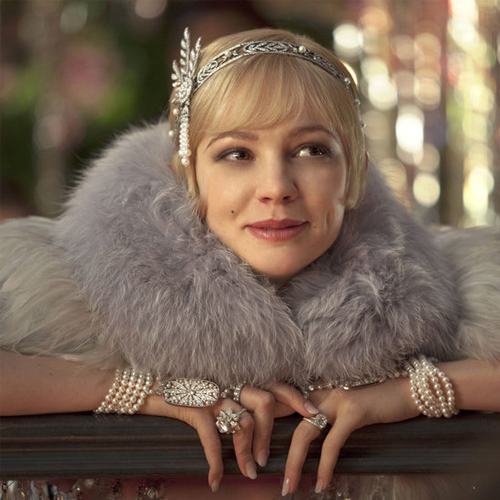 Because there is no party like a Gatsby party, the 1920 flapper dress is sure to be Halloween favorite for women! 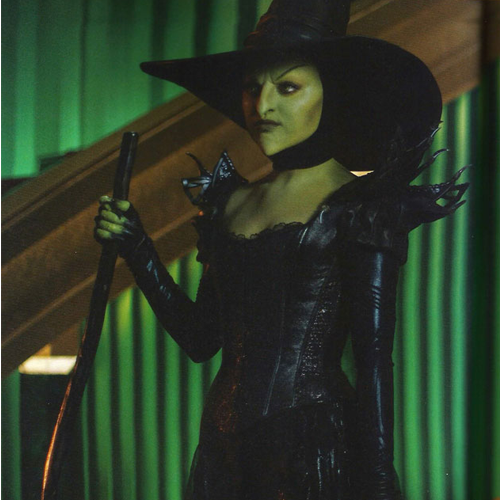 With the release of the movie OZ: The Great and Powerful, a new twist to the classic wicked witch of the west costume is guaranteed to be seen this Halloween! What costume do you think will be the most popular this year? Who needs a guy when you have warm delicious fries on your side. 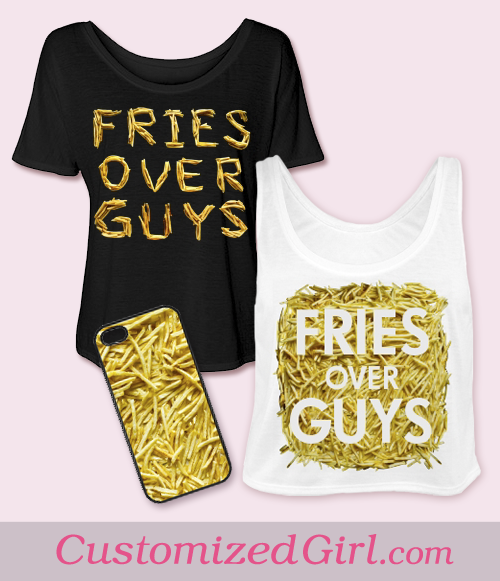 That’s why we love our new “fries over guys” designs and are excited to share them with you on Fry-Day! When boys are being boys and not listening or taking orders as they should let them know the simpler things in life, like fries, can easily replace them. 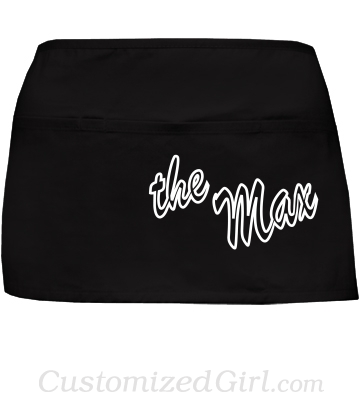 We have featured our “fries over guys” designs on a few of our fashionable flowy styles, but if you would prefer a to have the design on a t-shirt or a sweatshirt, you can easily make the change using the Customized Girl design center. 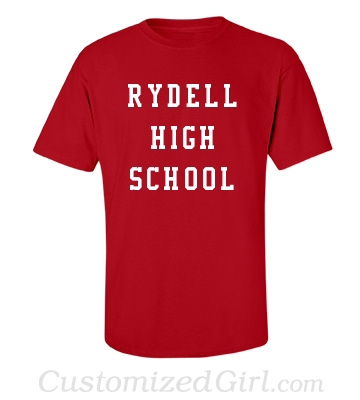 Don’t be caught playing ketchup and have one of your friends get a shirt before you! Want Fries Over Guys Shirts? We’ve Got Them! Shopping for a Halloween costume at stores can be frustrating! You are limited to what they have in stock and even if you do find one, there is no way to make changes to the costume before you buy it. 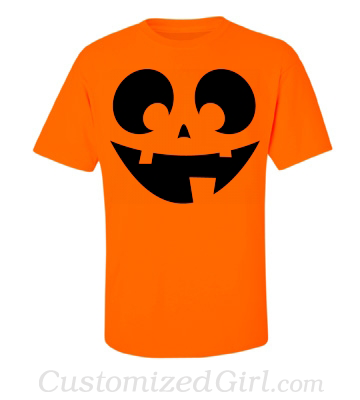 At Customized Girl, you can create the perfect Halloween costume by using our design center! To help you get started, we have created some popular custom Halloween costumes that you can enjoy as is or customize further by adding any text or art you like! Are you and a few friends looking for cute group costumes? You can design those too! Taste the rainbow and look sweet in these candy themed tank tops! Maybe you like things a little spicy on Halloween? Add whatever custom text you want to the white rectangle shape! 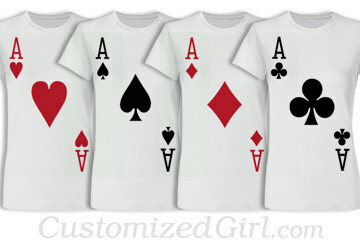 Will you be the Ace of Hearts, Spades, Diamonds, or Clubs? 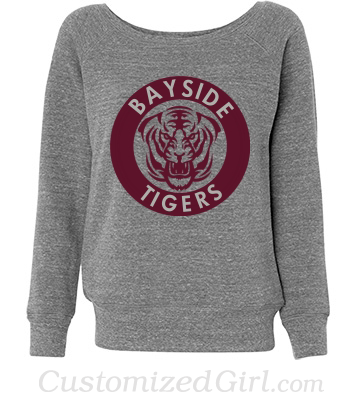 If you are a big Saved By The Bell fan, this Bayside High Sweatshirt and The Max Apron will have every other Saved By The Bell enthusiasts jealous! Why it’s greased lightning! Flashback to the 50’s and bring the classic movie Grease to life this Halloween! Have a baby on the way and looking to give people a spook on Halloween? 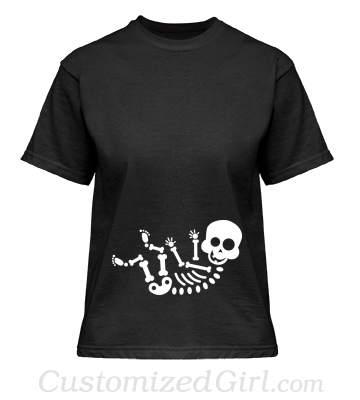 This skeleton baby maternity shirt will do just that! For those that need a costume, but really don’t want one. You can’t go wrong with a Halloween classic.